You’re going to LOVE this apple pie with crumb topping. It’s a sweet, tangy, buttery pie covered in a crunchy, cinnamon flavoured streusel topping. A classic, warming recipe that will help get you through the rest of winter! Does anyone else struggle with that awkward period between the beginning of January and the end of March? The excitement of Christmas and New Year is gone. But the weather outside is still cold and miserable, and there’s not much to look forward to except the countdown to spring. Do you know what helps me get through it? This apple crumble pie recipe. It’s so sweet and satisfying, and I love the combo of warm fruit and cold ice cream. It’s true winter comfort food. To be honest, I’ve never really considered having or making apple pie with crumb topping. I always thought it had to be one or the other- either apple pie OR apple crumble. But I can confirm that combining the two results in the best dessert EVER. 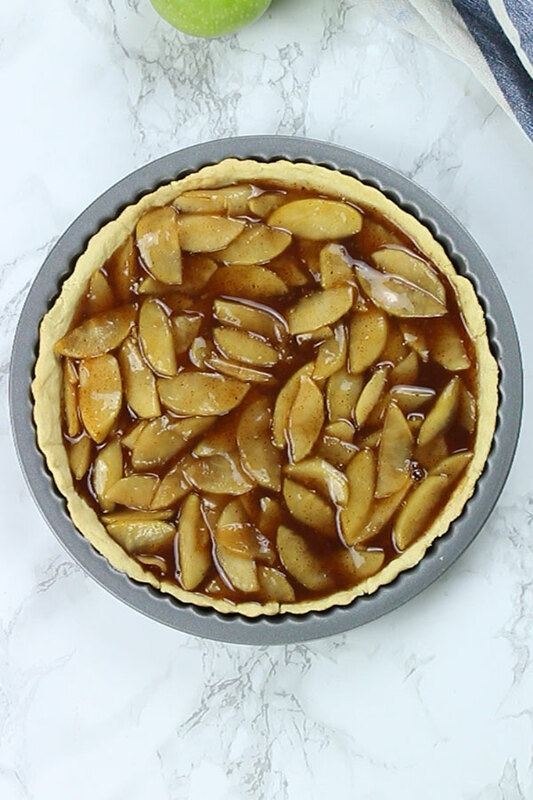 You start with a layer of pastry on the bottom, fill it with a sweet apple mix then finish it off with lots of crumbly cinnamon topping. This way of making it is also known as Dutch apple pie. Now, I’m not (and never have been) Dutch so my recipe might not be 100% the traditional way. But this is my own interpretation, and in my humble opinion, it is fantastic. The first step to making apple pie with crumb topping is the pastry. This pastry recipe has never failed me. But if you’d prefer, you can also use ready-to-roll pastry to save time. Simply switching dairy butter for vegan butter makes this whole recipe vegan-friendly! Most ready-to-roll pastries are vegan-friendly too. After you’ve combined all of the pastry ingredients together, you’ll need to put it in the fridge to chill for around 30 minutes. This will make the dough easier to roll. Once the dough has chilled for 30 minutes, remove it from the fridge and knead it lightly. This will help bring it back to room temperature and prevent cracks from forming when you roll it. Roll the dough out to fit a 23cm pie dish, then flute the edges using your fingers. I used a tart/flan tin to make this part easier. Blind bake the pastry first, for around 20 minutes. This will ensure the heavy filling does not cause the pastry to become wet and sticky. Using rice or baking beans to blind bake also prevents the pastry from rising. Use an aluminium tin for this recipe rather than ceramic. This will allow the heat to penetrate the dish more evenly and will prevent the bottom of the pastry from going soggy. The filling consists of a few things; apples (of course), cold water, cornflour, caster sugar, and lemons. First, you’ll need to peel, chop and core your apples. I like to use Granny Smith ones because they’re quite tart. Squeeze the lemon juice over the peeled apples to prevent them from browning quickly. Add the cold water and cornflour to a pan and mix well. Do not add cornflour to hot mixture unless you want floury clumps! Turn the heat on (medium-high). Add the caster sugar, lemon zest and cinnamon. Mix well then add the apples. Stir often until the mixture thickens and the apples soften slightly. This results in a perfectly sticky filling once cooked! Pour the filling into the pre-baked pastry. Now we’re ready for the topping! The crumble is my favourite part of this recipe! I just adore the cinnamon flavour. First, mix your flour, cinnamon, and sugar together. Then, begin adding the butter. Rub it into the flour mixture until it resembles breadcrumbs. Cold butter is key here. That’s especially important if you’re using vegan butter because it can be slightly “wetter” than dairy butter. We don’t want the butter to melt into the flour! Sprinkle the crumb topping over the filling and cover evenly. Bake for 45 more minutes until slightly firm on top. Can I use canned apple pie filling? I can’t promise that using canned apple pie filling will taste quite as good as making your own. But if you’re pinched for time, canned apple pie filling will definitely do the trick! I would recommend at least adding some lemon zest if you’re using canned apple pie filling. Although the recipe only calls for a tiny amount, it really helps to bring the flavours together! 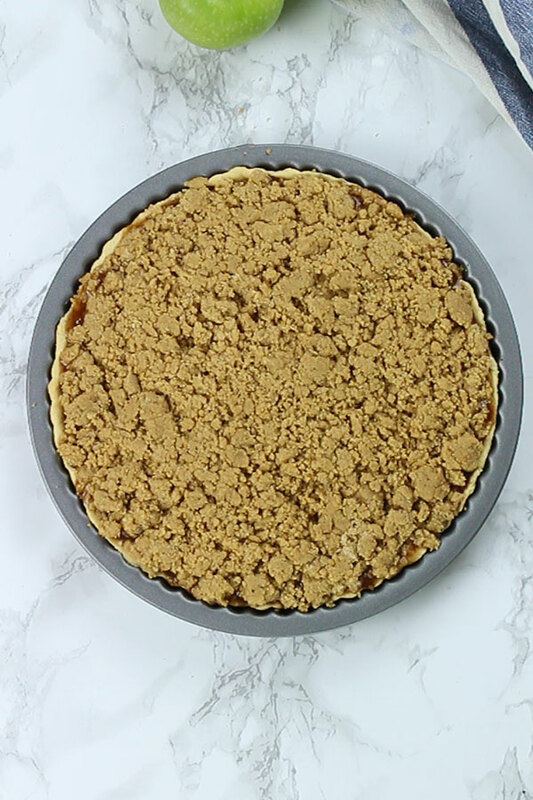 Can I freeze apple pie with crumb topping? Yes! This recipe is perfect for freezing. I’d recommend baking it first and allowing it to cool completely before freezing. You can wrap the pie tightly with foil or place it in an airtight freezer bag. Then, when you’re ready, just remove it from the freezer and remove the foil or bag. Put the pie onto a baking tray and bake in a 150°C / 300°F oven for 45-60 minutes. Check the temperature with a knife every so often, and you’ll know it’s ready when it’s warm all the way through. What to eat with apple pie? I prefer to eat my apple pie with crumb topping WARM. It’s so comforting- especially during the dreary tail end of winter. I hope you enjoy my own take on this beautiful recipe. If you make it yourself, tag me on Instagram or use the hashtag #bakedbyclo to let me see! A vegan take on the classic Dutch apple pie recipe. 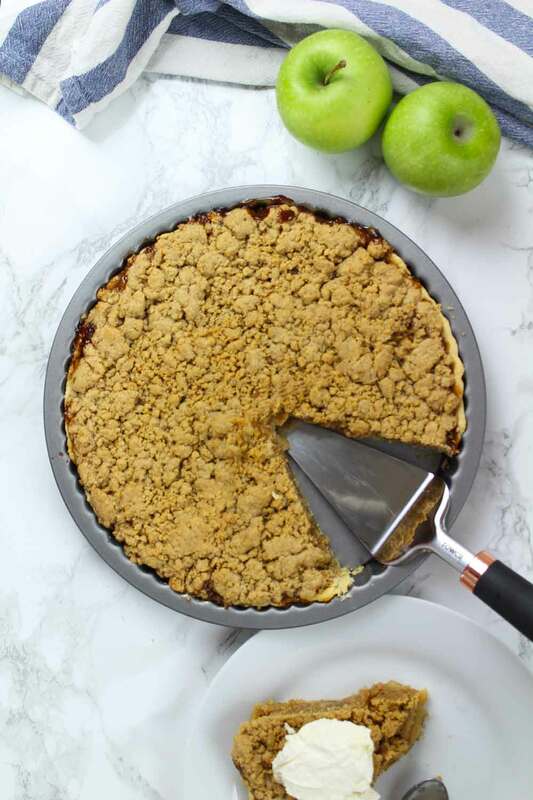 A sweet, cinnamon flavoured apple pie with crumbly streusel topping! Rub the butter into the flour to form breadcrumbs. 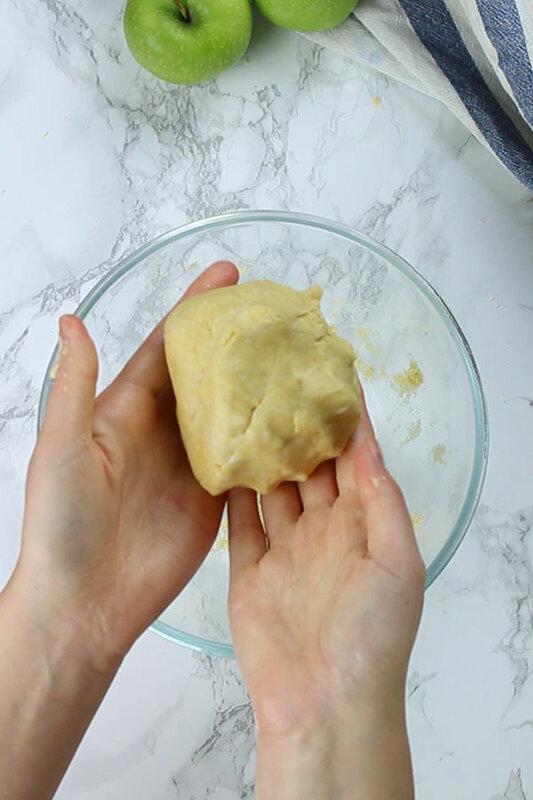 Add the water and combine with your hands to make a dough. Wrap the dough and chill it for 30 minutes in the fridge. Preheat oven to 200°C/ 400°F. Once removed from the fridge, lightly knead the dough to warm it up and prevent cracks. 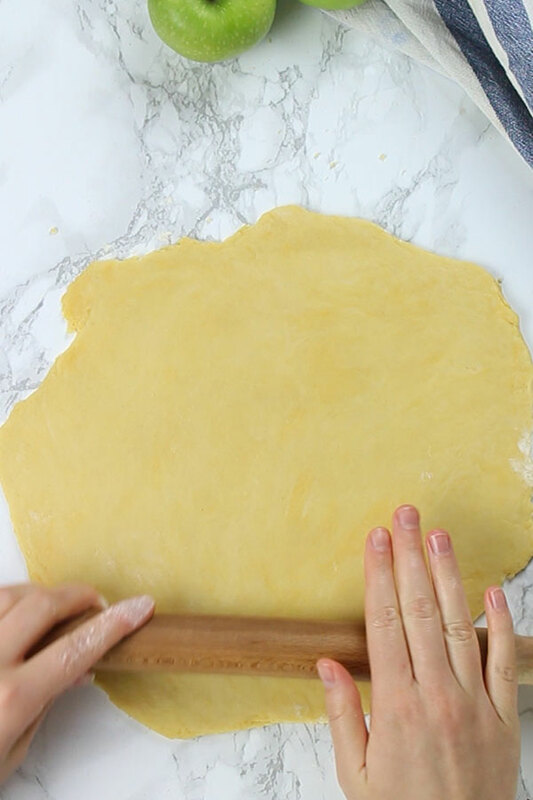 Roll out the dough (on a floured surface) to fit a 23cm pie dish and flute the edges using your fingers. 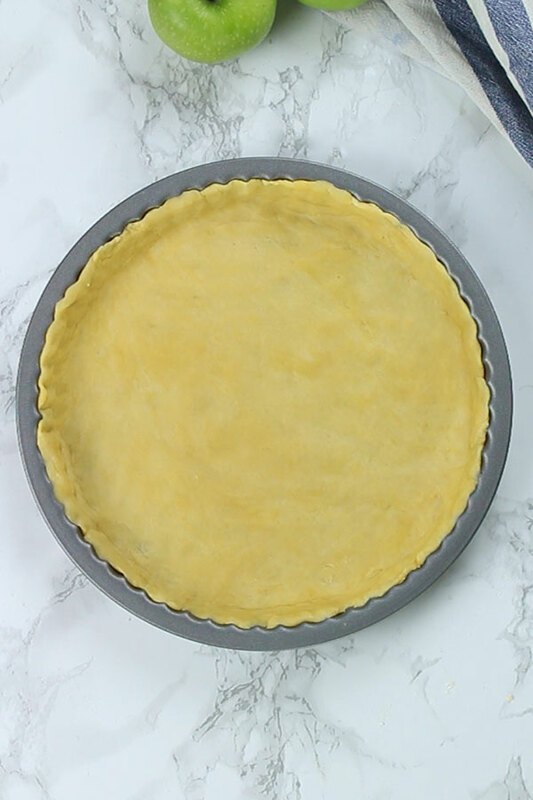 Alternatively, use a flan or tart tin with fluted edges. Cover the pastry with parchment paper then add rice or baking beans on top to blind bake. Bake for 20 minutes then remove from the oven. Remove the paper and rice/beans. Peel, chop and core the apples. Squeeze the lemon juice over them to prevent browning, then place to one side. Add the apples. 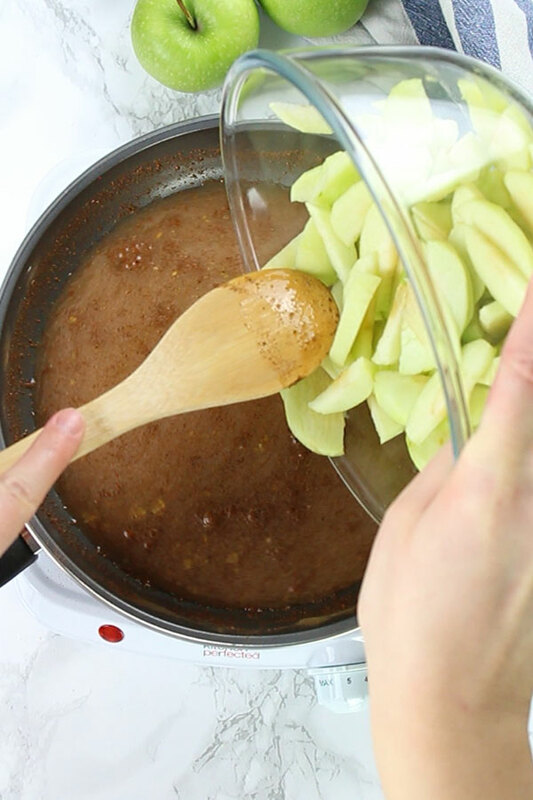 Stir often until the mixture becomes slightly thick and the apples have softened slightly. Remove from the heat and set aside to cool. Mix together the flour, sugar and cinnamon. Rub in the butter to form large breadcrumbs. Turn the oven down to 180°C/ 350°F. Pour the filling into the pastry case. Pour the crumble topping to cover the apple mixture and pat down into place. Bake for 45 minutes until slightly firm on top. Leave to cool completely before attempting to cut into slices. Once sliced, serve warmed up in the oven or microwave. *Can be stored at room temperature, covered with foil, for 2 days or in the fridge for up to 5 days. This is the perfect pud !. Absolutely delicious and so easy to make. Will definitely be making again soon. Looks good…. but how much rice should I use to bake the pastry?